Have you ever wondered if there really was such a thing as… Forever Love? The 42 contributing authors to this anthology believe there is, and they share their real-life stories to encourage you as well. Whether you’ve already found your forever love or are still longing for that person to come into your life, these stories collected from across the globe are guaranteed to make you misty-eyed and renew your faith in the power of enduring love. 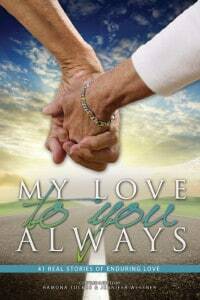 Enjoy this wonderful collection of the best real-life, love-for-a-lifetime stories, guaranteed to make you misty-eyed. Published by the Christian publishing house OakTara.